Temporal plotting provides more than just a logic of continuance. A narration's structural patterns, rhythms and pacings can evoke feelings of boredom, arousal, calm, anxiety; encourage identification with the story world and investment in outcomes. How can such affective-expressive uses of causality and linear sequencing work in a graphic interface? Database narratives are often made of small narrative units organized for nonlinear access. At this micro-level, familiar temporal structures and plots can help orient a user to story. But at the macro-level, temporal order is often communicated through graphic devices such as a timelines and timestamps . Such methods of navigating time are common in spatial and database narratives and are effective at imparting temporal information, but they do not work well for narrative engagement. An interface is perhaps more engaging when displaying subjective time through spatial relationships. For example, a small frame embedded within a larger frame can spatially denote a "flashback." Grids, timelines and nested narratives (mise en abyme) act both as framing device – for how to read one narrative in light of others – but also as a way to graphically model the nonlinearity and recursion in thought and experience. 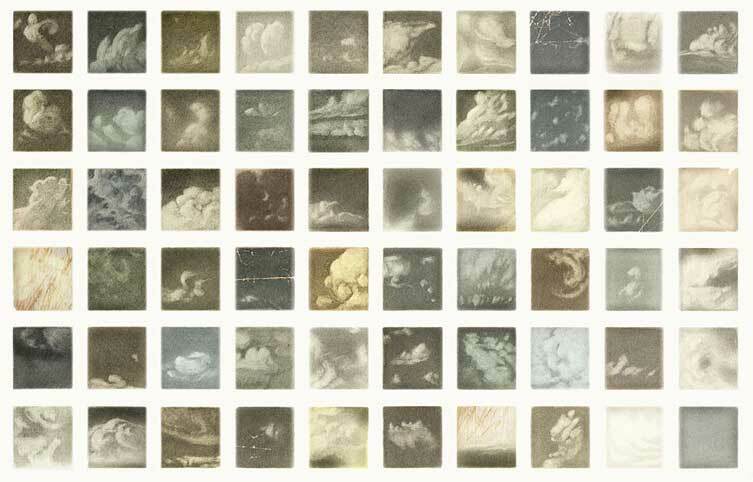 Early in Shaun Tan’s graphic novel, “The Arrival,” there is a double-page spread showing a grid of clouds. In the context of the story, the grid makes visible on macro and micro levels, the passage of time, the loneliness of travel, the longing for home, boredom, the small changes that each day brings. The point of view of the protagonist is implied, not articulated. There is no image of the man looking up at the sky. The reader, turning the page to the clouds, is momentarily without narrative bearing as the clouds invoke a subjectless reverie of "passing days." Compared with a more mimetic approach – a single image of the protagonist sitting alone in thought – the grid is relational on many levels: as a simultaneous view of distinct days in the story world, and as an affective-expressive identification that is not attached to a single point of view. Like Tan's grid of clouds, a spatial montage of short loops can display not a representation of narrative action, but a field of temporal and spatial relations that emerges and is produced as narrative in the encounter with a user. One of the earliest expressive genres of the internet, the short loop has not yet evolved as a narrative device. A loop, though made of time, puts a stop to narrative momentum. Loops are eddies in the flow. They can be grasped at once and, most importantly, in relation to other simultaneous loops in an interface. Because of this almost atemporal quality, loops act as semi-static signs that point to more complex temporal experiences and relations. This is why they are often used as a navigation tool for accessing large databases. For example, loops are used for quickly navigating photos in Apple's iPhoto. Manovich asks, "Can the loop be a new narrative form appropriate for the computer age?" Is there semantic meaning and, more importantly, relational meaning in the loop that can be exploited in a narrative construction? Version 80 id 29067 of this page, updated 20 December 2012 by Monika Kin Gagnon. Created by Will Luers.